New government plans could double the current 5p fee for plastic carrier bags in England. Under new rules which could come into effect in January 2020, the charge for a plastic bag would be raised to 10p and extended to all retailers. So how has our usage of single-use plastic bags changed since the charge was first introduced in 2015? And who would be affected by the new rules? Here are all the facts and statistics you need to know. The use of plastic bags in England’s supermarkets was out of control in 2014. More than 7.6 billion carrier bags were handed out to customers that year and that figure had been on the rise for the previous four years. England was the last country in the U.K. to introduce a charge for single-use plastic bags. Wales was the first to do so, in 2011, followed by Northern Ireland in 2013 and Scotland in 2014. All saw plastic bag use decrease by 70-80% year-on-year. How has England’s plastic bag use changed since 2015? Since the fee was first introduced in October 2015, set at 5p per bag, the government estimates that retailers have collectively taken 15 billion carrier bags out of circulation. The UK’s seven biggest supermarkets (Tesco, Asda, Sainsbury’s, Morrisons, Waitrose, Marks & Spencer and The Co-op) have seen plastic bag sales plummet by 86% since the introduction of the 5p charge in 2015. That’s the equivalent of one person using around 140 plastic bags each year before the charge, to just 19 bags in 2017-18, according to a government report. And the environmental impact of our reduced plastic usage is stark. The Centre for Environment, Fisheries, and Aquaculture Science (Cefas) estimates that plastic bag marine litter has dropped by half since the charge was introduced. However, the charge only applies to large retailers. Small and medium shops still provide over 3.6 billion single-use plastic bags to their customers every year without the charge. Although, some smaller shops – estimated to be about a fifth of England’s 253,000 small and medium businesses – have voluntarily added a 5p charge to their bags in an effort to combat our excessive use of plastic. Who might be affected by the new plans? The government’s public consultation on its changes to the plastic bag fee is open for eight weeks, until late February 2019. 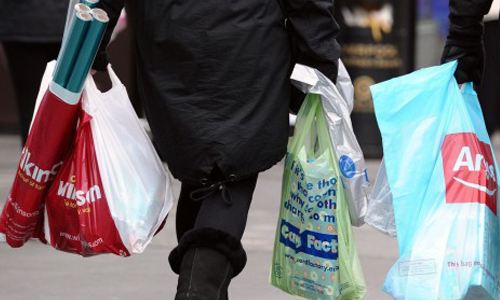 Consumers would all be affected by the plans, as they’ll see the cost of a carrier bag rise from 5p to 10p. While the current rules only apply to retailers with more than 250 employees, retailers big and small would be targeted by the plans. All retailers who were not already included in the levy would also find themselves having to charge customers 10p for a plastic bag. Speaking on behalf of the shops they represent, the chief executive of the Association of Convenience Stores, James Lowman, said extending the charge would be a welcome move. “This has been shown to be highly effective at reducing waste, whilst also raising money for local, national and environmental charities,” he said. What other plastic items is the government trying to eliminate? On the same day the plans to update the plastic bag charge were announced, schools were also encouraged to eliminate their use of single use plastics by 2022. In the Autumn Budget, the Chancellor also announced a plan to introduce a tax from April 2022 on plastic packaging that does not contain at least 30% recycled content. And early in 2018, the U.K. banned cosmetic and personal care products which contain plastic microbeads. The E.U. is also on the way to banning plastic straws, cotton swabs, disposable plastic plates and cutlery by 2021.